It has been 150 years in the year 2003 since the legendary arrival of German’s famous Africa researcher Heinrich Barth (16 Feb 1821 – 25 Nov 1865) in the mysterious city of Timbuktu. In August 1853 he attained the small place Bambara-Maoundé, coming from Dori (today’s Burkina Faso). Two weeks later he entered a pirogue to Sareyamou and reached Timbuktu in September. Not until nine months later he managed leaving the city towards East – after some unavailing attempts. It was this long sojourn in Timbuktu which we owe 500 written pages about today’s Mali, and the history of the Songhay and Timbuktu in Reisen und Entdeckungen in Nord- und Centralafrika in den Jahren 1849 bis 1855. This jubilee was commemorated by the German Embassy in Mali, the Society of Technical Collaboration (Gesellschaft für Technische Zusammenarbeit, today GIZ), the Research Centre Local Knowledge Point Sud, the Malian Minister of Education and the Heinrich-Barth Society (Cologne, Germany). The conference took place from 29 November to 5 December 2004, and served not only for the exchange of the researchers among themselves, but also for meetings with Malian scholars and the Malian public. Thematic focuses have been Heinrich Barth, his epoch and Africa – Heinrich Barth and the history of the Sahel – Heinrich Barth as an anthropologist, mediator among peoples and cultures – Heinrich Barth, art and literature. The present work contains the most important contributions of this congress. 14 articles dealing with diverse thematic issues give an eclectic survey of most recent research results concerning Barth’s life and work. [...] this multidisciplinary collection is well suited to inspire not only those interested in a critical history of travel and exploration but also those concerned with West African history in general. Studierenden und Fachwissenschaftlern verschiedener Disziplinen bietet der Band einen guten Einstieg in Themenbereiche wie Reiseforschung, Wissenschaftsgeschichte, Kulturkontakt u.a.m., indem diverse methodische Zugriffe auf die Persönlichkeit Barth sowie sein Werk zu weiterführenden Fragestellungen anregen. The emphasis in the present volume is on Barth’s influence in the development of European historiography and ethnography of Africa. 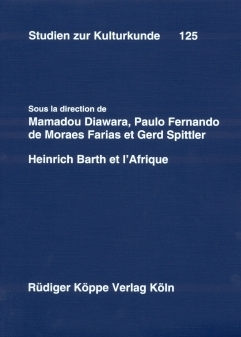 There are many important questions and conclusions which are not limited to the personality of Barth only but concern the research in the history of European encounter and exploration of Africa in general. It is therefore most desirable that the present volume should reach a wider audience than the narrow confines of Barth’s fan club.